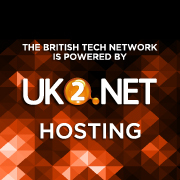 We are proudly sponsored by UK2.net who pick up the cost of the bandwidth for all the shows and the hosting on the British Tech Network, which now is a considerable amount. They have been supporting the network for most of the time that the network has been going. Please click the UK2 logo link on this page to let them know that we sent you, even if it is just to sign in to your account. BRITISHTECHDNS – for free DNS for up to 2 years. BRITISHTECHDOMAINS – for 20% off your domain registration. BRITISHTECHVPN – for 50% of your first month use of a purchased VPN. BRITISHTECHSERVER – for £50 off any gigabit server on any contract length (online deal online). BRITISHTECHVPS – for free first month when purchasing an entry level VPS (or the same amount of £8.95 off the purchase price). Help us to keep the network going by using these offer codes when purchasing from UK2.net by using the logo link above. If you do not, we do not get the credit for your purchase, even if you use the offer codes. By UK2 knowing that it was us that sent you, it ensures the UK2 continue to provide the hosting and bandwdith we need to keep the network going. UK2 – Support them because they support us!